8/1/09: This blog is no longer being updated. All content has been moved to www.livefrombeijing.com. Please update your bookmarks / links. The other night I had a great time presenting at the Beijing Energy Network's wonderfully titled BEER (Beijing Energy & Environment Roundtable) event. The title of my talk was "150 Million and Counting... Controlling the Energy and Environmental Impacts of China's Vehicles." I tried to have fun with it - I presented it at 9pm at a bar, after all - while touching on a range of topics and issues related to the transportation sector in China. I welcome any questions or comments either here or by e-mail at livefrombeijing at gmail dot com. Thank you very much for taking the time to post these. I was terribly disappointed at missing your talk the other day -- I fell on the way there and scraped myself so badly I decided I had better turn back and get cleaned up. Anyway, thanks again and have a safe trip. How much does the weather on an overcast day like today affect the API readings? Do clouds actually trap particles in the city? Notice 8/1/09: This blog is no longer being updated. 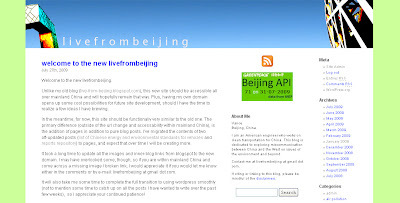 All content has been migrated to www.livefrombeijing.com. Please update your bookmarks / links. Please also note the new feed address: http://feeds.feedburner.com/livefrombeijing/feed. I am an American engineer who works on clean transportation for China. This blog is dedicated to exploring miscommunication between China and the West on issues of the environment and beyond. Contact me at livefrombeijing at gmail dot com. If citing or linking to this blog, please be mindful of the disclaimers. what is the api and how is it calculated?